Please refer to our stock # 1929 when inquiring. Monumental Chancay Pottery Vessel of a Hunter and Monkey, Peru, ca. 1100 - 1400 CE. The hunter with pear-shaped body painted in black and cream with patterned tunic. The face marked by tattoos and wearing single pendent earing. Sun Disk ornament for headdress with a small monkey perched on the right shoulder. In excellent condition. 21 1/2" high x 15" diameter. Ex: Sotheby's New York. Ceramics are also a very common feature of the Chancay culture. This pottery has been found mainly in the cemeteries of the Ancon and Chancay valleys, for example at Ancon (archaeological site). The Chancay civilization produced ceramics on a large scale using moulds. However, open vessels with more than 400 different types of drawings that have yet to be decrypted, uniquely created by artisans, have been found. The technique used in creating ceramics was with a rough matt surface that was later painted with a dark color, usually black or brown, on top of a lighter cream or white background. this dark on light characteristic is known as black on white. Vessels are often large and quaintly shaped. Egg-shaped jars are some of the more common. Ceramic dolls or female figurines were also created. These were usually large, female-looking dolls made from clay. The faces and sometimes the upper sections of the body are covered with ornaments of different geometric shapes. The eyes were accentuated with a line on each side and the arms were usually short. These geometric ornamentations are very common on Chancay ceramics. 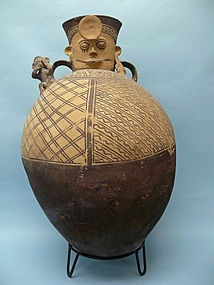 Other common ceramic vessels were oblong jars with narrow necks and wide mouths, with designs in the form of human faces and geometric shapes painted in the black on cream technique. Other common animal shapes are birds or llamas. There were also miniature sized idols calledcuchimilcos which were anthropomorphic shapes representative of human figures, having prominent jaws and eyes painted in black. These cuchimilcos figures usually had their arms extended as if they were ready to fly or inviting a hug. It is believed that they were used to turn away bad energies. This is perhaps why they have been mostly found in the tombs of the Chancay nobility.